Michael “Mike” Wayne Sanders, age 69 of Rockingham passed away Sunday, February 3, 2019. Funeral services will be conducted at 2:00 p.m., Thursday, February 7, 2019 at the Richard Boles Funeral Service Chapel officiated by Kenneth Blease. Burial with Law Enforcement Honors will follow in Hillside Memorial Park. Mike was born October 31, 1949 in Scotland County, the loving son of the late Walter Curtis Sanders and Faye Brigman Sanders of Laurinburg. 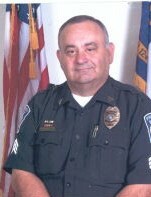 He served as a Law Enforcement Officer for 35 years retiring as Sergeant Sanders of the Pinehurst Police Department. He began his law enforcement career in 1973 with the Scotland County Sheriff’s Department. He also worked with the Richmond County Sheriff’s Department, Rockingham Police Department and held the office of Police Chief with the Ellerbe Police Department. He also served as a member of the East Rockingham Volunteer Fire Department. And enjoyed working with the Pinehurst Special Olympics. Mike enjoyed his time as a former member of the Scotland High School Marching Band. He was an avid history student and especially enjoyed studies about the Civil War. One of his favorite pass times was watching old western movies, especially those with John Wayne. Mike is survived by his wife, Billie Darlene Clewis Sanders of Rockingham; children, Michael “Shawn” Sanders and wife, Rebecca "Becca" Yountz-Sanders of Apex; Brandy Michelle Parker and husband, Darrell Parker of Sanford; his grandchildren, Jackson Parker, Caroline Sanders, Ava Parker, Annaliese Sanders and a grandson due in April. Visitation for family and friends will be from 6:00 until 8:00 p.m. Wednesday, February 6, 2019 at Richard Boles Funeral Service. The family requests for memorial donations to be given in Mike’s memory to the North Carolina Law Enforcement Torch Run for Special Olympics.